Here, a thin, blender-made gluten-free popover-like batter bakes into a delicate puff of cheesy goodness. 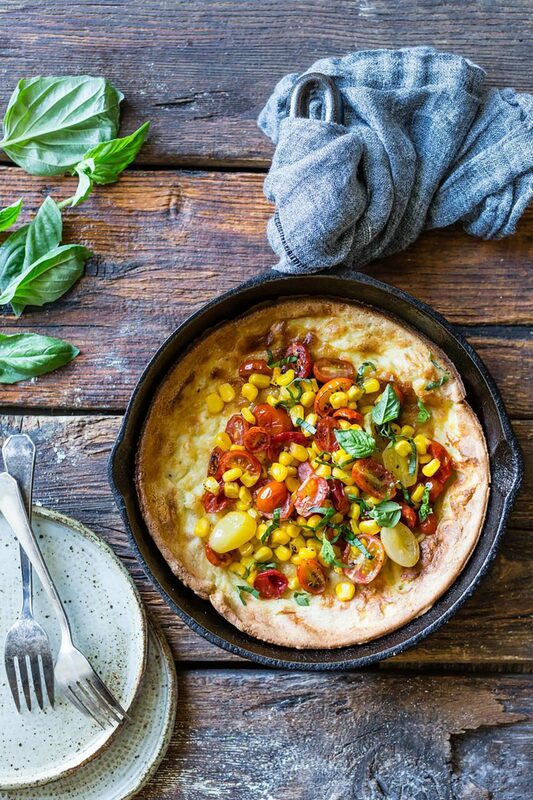 Crowned with oven-warmed corn and cherry tomatoes, this gluten free Dutch baby is a stunning, light brunch or supper entrée. MAKES 1 (8-INCH) DUTCH BABY To serve a small crowd, double the recipe and bake the dutch baby in a 10-inch skillet. Position a rack in the center of the oven and preheat to 425ºF. Place the eggs, milk, corn flour, rice flour, oat flour, salt, and a few grinds of pepper in the bowl of a blender and blend on low until combined, scraping down the sides as needed. Stir in the cheese. Place the butter in an 8-inch ovenproof skillet and warm in the oven to melt, 1 to 2 minutes. Swirl the butter around the pan, then add the batter, return to the oven, and bake until puffed and golden, 15 to 20 minutes. Meanwhile, make the topping: on a small rimmed baking sheet, toss together the tomatoes, corn, olive oil, salt, and a few grinds of pepper and roast alongside the Dutch baby until beginning to caramelize, 8 to 12 minutes. To serve, toss the basil into the vegetables, spoon into the center of the Dutch baby, slice into wedges, and serve.